On 25February, 2014 teachers and pupils of Khojaly secondary school No. 4 arranged an event at school on ‘Do Not Forget Our History’ as a continuance of Agsu cultural tour for Khojaly pupils on 23-24 February by MIRAS Organization. On 21-23 February, 2014 schoolchildren of school No. 1 and 4 of Khojaly Village in Goranboy region, Azerbaijan visited Medieval Agsu Town Archaeological Tourism Complex under guidance of teacher of physics, Kanan Guliyev and secondary school teacher, Sadagat Ibrahimova. Dozens of Khojaly settlers living in different parts of the country were listened and recorded and thereby valuable video archive was created. MIRAS Social Organization in Support of Studying of Cultural Heritage arranged a seminar entitled ‘attitudes towards our language and cultural heritage in the creation of Mahammad Amin Rasulzade” jointly with Institute of Literature of National Academy of Sciences of Azerbaijan on 20 February, 2014 on occasion of 130-year of M.A. Rasulzade and 21 February International Mother Language Day. 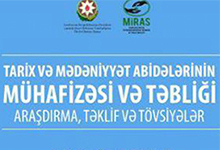 MIRAS Social Organization in Support of Studying of Cultural Heritage took part at next meeting of Council of Young Scientists and Experts on 20 February, 2014 and presented seminars, conferences and symposiums intended in 2014. Dozens of Khojaly settlers living in different parts of the country speak and we record and relevant valuable video archive is created. According to the project, the members of MIRAS Social Organization participate voluntarily at reading books for eye disabled people. A group which went to library under guidance of Nijat Nuriyev, MIRAS coordinator with members on 22 May familiarized with the condition there and launched the project. As sequence of the project of MIRAS Social Organization in Support of Studying of Cultural Heritage on Medieval Agsu Town Archaeological Tourism Complex’ in 2010-2013, the project ‘Dialogue Center for Science, Culture and Economy-Agsu” has been launched recently. The project consists of several steps and one of them is establishment of Uljug ethnographic estate. The scholars from Azerbaijan, Italy, Belgium, Albania, Turkey, Belarus, Romania and France along with Macedonia attended the conference. Azerbaijan was represented by the members of MIRAS Social Organization in Support of Studying of Cultural Heritage (Dr. Fariz Khalilli, Teymur Najafzade, Shola Bayramova and Irada Gadirova) with interesting reports. Photo exhibition “Archaeological pearls of Azerbaijan” was co-organized by MIRAS Social Organization in Support of Studying of Cultural Heritage and Institute for Socio-Cultural Anthropology of Macedonia on 17th January 2014 in Ohrid, Macedonia in Museum “House of Robevci”. 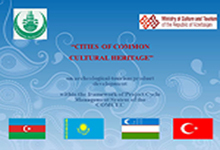 On 1 December, 2013 MIRAS Social Organization in Support of Studying of Cultural Heritage held next meeting. The meeting is held every year due to the organization's charter.